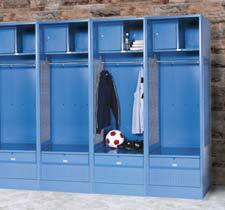 Dressing rooms in sports stadiums and athletic centers can be furnished with a variety of open access sports lockers. These units are designed to fully accommodate the storage of uniforms, day clothing, special athletic equipment, and valuables. All locker models share the same basic design, but their dimensions, special features, and material builds vary widely to accommodate different environments and different types of sports. These lockers are made from heavy duty steel, wood, or plastic. Metal units are ventilated in order to prevent the buildup of moisture and odor. Wooden units are made from treated wood that is humidity resistant. Plastic lockers in dressing rooms are the most corrosion and vandal resistant because they by nature resist moisture and are very difficult to dent. They are most commonly used for the storage of heavy gear because they are the most resistant to denting. Professional sports stadiums, universities, and varsity high school athletic programs typically prefer the wooden stadium locker modelsbecause they feature both an efficient storage design and a higher quality aesthetic more in keeping with an upbeat, positive, and winning attitude. Metal open access sports lockers are typically less expensive and more suited to heavy traffic facilities that serve a multipurpose function. A good example of such a facility would be a civic center that plays host to a variety of little league, minor league, and corporate league games ranging from football, to softball, to soccer, to basketball. Plastic sports lockers are sometimes used in these facilities because they are extremely corrosion and vandal resistant. They are also easy to clean, and their resistance to denting also makes them ideal for the storage of heavy duty, non-athletic gear. Smaller towns that do not have a dedicated sports stadium, but rather a civic center used for a variety of public activities, may want to consider plastic open access lockers for dressing rooms that may also be used by municipal workers. All open access sports lockers feature three interior storage sections. There is a top shelf unit that creates a cubby area where players can store their helmets, gloves, shoes, water bottles, or other items that can be fit into its space. Some styles have a divider that creates an open storage space on one side of the upper cubby and a closed space protected by a locked door on the other. Dressing room lockers also have a middle section that constitutes the bulk of their vertical space. This area is typically used to store uniforms and larger pieces of equipment. Coat rods allow for day clothing to also be hung up neatly after athletes have changed into their uniforms. In professional sports stadiums, players also store thermal gear for winter football games, baseball bats, and extra jerseys and practice basketballs in this section. Footgear is typically placed here so it can be easily and quickly retrieved before a game. Open access sports lockers also have a foot locker compartment at the bottom that in many models doubles as a bench when the player needs to put on athletic footgear. This compartment is secured with a lock and is typically used to store valuables. However, there is sufficient space here as well to store other forms of smaller athletic gear if the athlete wants to do so.